My first recollection of Daniel O’Keefe, my grandfather, was that he seemed to be a tall, giant of a man when I was young. That was not surprising. I was only two or three years old, everyone and everything around me looked tall. He worked as a lockmaster if I recall correctly and enthralled me with his whistle and flashlight! 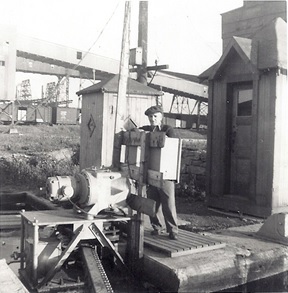 Daniel O’Keefe – lockmaster, Montreal, PQ, circa 1950’s. He loved to buy me new boots. It seemed that in the first year of my life I was in receipt of new boots every two weeks so my mother said. He was very proud of me. “The boots will make a man of him one day” he said. Boots reminded him of his army days. But they did me no good, I ended up with hammer toes as a lifelong affliction, which are a constant reminder of the love and devotion of my lost grandfather. Daniel was five feet three inches tall, with a dark complexion, hazel eyes and brown hair. Daniel, born 19 May 1890, was 24 years old the day he attested to join the Canadian Expeditionary Force (CEF). He weighed only 110 lbs with a waist of 34 inches when he was medically examined and declared fit for service with the CEF on 14 June 1915. He was a proud Irishman and Roman Catholic. On his right forearm he had tattooed a Harp with the saying “Erin-go-bragh”. He was attested to the 60th Bn C Company on 15th June 1915 at Montreal from whence he hailed. He was a teamster in civilian life but that life was about to change dramatically. The family history says he trained at Valcartier before he was dispatched overseas. The picture above (in military uniform) was taken after a night of rabble rousing and drinking. He and group of buddies decided that they should mark their departure with a parting photograph. He later confessed to my mother Shirley, that he was definitely three sheets to the wind on that occasion. It wouldn’t be the last. But the war came to affect him so greatly that he made a pledge to God that if he was spared, he would never touch another drop. He was true to his word and eventually became a teetotaler. Daniel was shipped to England on the troop ship S.S. Scandinavia that sailed from Montreal 6 November 1915. He landed in the United Kingdom near Bramshott where he was immediately admitted to hospital with the grippe on 25 November 1915. He was not too sick at all. He was discharged from hospital on 26 November 1915. Daniel must have struggled under the newness of military discipline. He decided to test its boundaries in 1916. He went AWOL for a very short time from 11 PM on the 9th January to 6 PM on the 11th Jan 1916. This incident cost him dearly. He was docked three day’s pay and given six days of digger time by the Adjutant of the 60th Bn for his faulty behaviour. It didn’t really mean too much other than the financial cost. Daniel embarked for France shortly thereafter on 20 February 1916. He arrived in France at Le Havre on the 21st of February 1916. He fought in the fields of France and Flanders for the next several months without incident. On August 12, 1916 at Hill 60 he was wounded and was shot in the left leg. He was evacuated to a casualty clearing station and where he later recovered. The wound was not serious enough to be a “blighty”. Daniel rejoined his unit on 29 September and continued to fight with the 60th Bn until 16 May 1917 so one part of his records state, when he was transferred to the 116th Bn. That is significant in our family’s history. 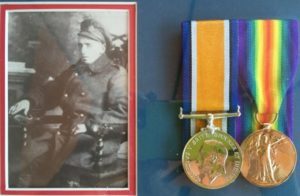 Daniel fought with the 60th Bn through Vimy Ridge and had a share in the ultimate victory accomplished there. It was an accomplishment that my mother was particularly proud of. But the events of Vimy may have had an impact on him, we’ll never know. He ran into trouble once again on 24 May 1917. He had a bit of the drink. He was caught intoxicated in charge of a team. He was sentenced 7 days field punishment for that breach of discipline by the OC. He enjoyed the OC’s displeasure once again for another incident on 11 November 1917 and endured another round of field punishment. Daniel had been in the field from 1916 to 1918. The 60th Bn may have been stood down and rested from time to time while he was there. But the fact was that this rest was in-situ in the debris of war. Daniel would only receive leave three times during his duty. His first leave was the 9th of December 1916 where he was granted 10 days leave of absence. He was then granted 14 days leave to England on the 7th December 1918 and a final leave to the UK, 10 Feb 1919 while proceeding overseas back to Canada. Daniel like many others, endured the face and ugliness of war, daily for the better part of two years, without relief. It is no wonder that many resorted to their own devices and ended up on the wrong end of the law. Daniel finished the war with 116th Bn. Another military record indicates that this transfer occurred sometime between 26 March and 4 April 1917. The 116 Bn was a unit within the Third Canadian Division. It was held in reserve at Vimy Ridge. He was repatriated, returned to Canada, and sailed from Liverpool on 8 March 1919. He was discharged a few short days later and placed on the Division pool’s strength on the 17th of March 1919, a fitting end for a proud Irish Canadian. Daniel was struck off strength on 19 March 1919, which marked the end of the Great War for him. Daniel was a single man. He had a sister Annie who lived on 464 Laval Avenue in Montreal. He earned a dollar a day as a private. He had the responsibility of her well- being and made sure that his sister, Annie, was well taken care of while he was away. He allotted $15 per month to her that was roughly half his pay as a private in the CEF. Service records tell us a lot but they do not necessarily tell much about person’s background story. My mother said that Daniel was greatly affected by the loss of a brother during the war whose name was Oney O’Keefe, born 15 April 1889. He named a son after him but regrettably, his namesake Owen, only survived eight months of a very short life. Oney O’Keefe was 25 when he joined the CEF 19 November 1914 and served with the 24th Bn. Oney was killed one year later in the trenches of Wytschaete in Belgium on 18 December 1915. He is buried at the La Laiterie Military Cemetery. He lists as his next of kin, his sister M. O’Keefe who lived at 24 Benoit Street in Montreal. His civilian trade like Daniel’s was “driver”. 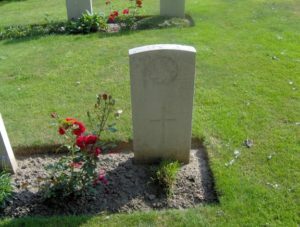 Headstone of Oney O’Keefe, buried at La Laiterie Military Cemetery, Belgium.